The bald eagle is the largest raptor in North America, the greatest predator of the sky. Its white head and dark feathers are awe striking and unmistakable. As we all recall, animals are powerful energy workers and bringers of deep knowledge; teachers and balancers of human misalignment. A powerful totem in many cultures, a bald eagle brings great strength and power.The white head aligns crown chakra to tail, mimicking the pillar of light achieved in the meditation practices of many cultures. The dark feathers integrate root chakra and body knowledge, the card of the warrior shaman, the brave and deep forest soul. Eagles have no predators in nature but are threatened by chemicals in the environment which cause their eggs to be unstable. 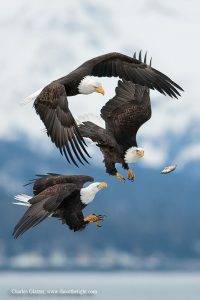 When eagle comes around know that you are receiving a huge blessing and affirmation that you are on the right track, but also see where you can clean your surroundings and diet of unnecessary chemicals and safeguard your body from the onslaught of environmental toxins. In many native cultures the eagle is associated with the snake, as they do feed on snakes among other creatures. This is a very powerful association as the snake is a transformer and a mover through the underworld and the earthly realms. Divine Abundance provided as a lavish banquet to the chosen. These are among the many blessings conferred by the eagle.